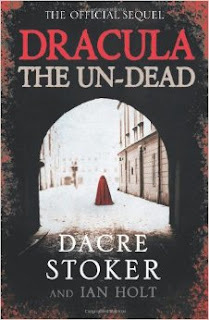 I seem to remember receiving Dracula the Un-Dead as a present, from a relative who knew that I had enjoyed the original Bram Stoker book and noticed that this was a sequel written by one of Stoker's descendants. I've always been a bit ambivalent about the prospect of reading it, because on the one hand it's a sequel to a book that I enjoy, but on the other I couldn't help but think that Dracula had ended on a pretty final and happy note, so couldn't really conceive of what the sequel could possibly run with. But, like many of my books, it has been on my shelf long enough that it has guilted me into finally picking it up. Dracula the Un-Dead follows Quincey Harker, the son of Jonathan and Mina Harker, who decides to defy his father's decision for him to follow him into the realm and become an actor instead. He finds himself falling in with an actor named Basarab who is taking Europe's theatres by storm; Basarab's patronage leads to his inclusion in the troubled production of a little-known gothic novel named Dracula, headed by its author Bram Stoker, and the revelation of a whole host of secrets that his parents have kept from him. I have some seriously mixed feelings about Dracula the Un-Dead, especially when considering it as an official sequel to the original 1897 novel. If I were to sum up my feelings, I feel that this novel had the wrong audience in mind. This is where the author notes at the back really help, because without them the book could seem somewhat incompetent. Basically instead of feeling like a true sequel to Dracula, it feels like something that you would get if Hammer Horror were given permission to make a direct sequel to the Francis Ford Coppola adaptation, and they also had a surplus of fake blood that hadn't been used in an earlier production. This is due to the fact that the authors make several alterations to the original canon and almost all of them have their origins in the various film adaptations that have been made of Dracula and the vampire fiction that it inspired. The two that are most egregious are as follows: first, that vampires burn up if exposed to sunlight, and second, that Mina Harker and Dracula had a romance. They are direct references to F.W. Murnau's Nosferatu and Francis Ford Coppola's Bram Stoker's Dracula respectively, and they encompass the main problem that I have with the novel: it is aimed squarely at the fans of the film adaptations, and not at the fans of the original novel. I somehow doubt that out of all of the people who have watched and enjoyed a Dracula film adaptation there are many who decided that they would read the source material afterwards, and if they aren't reading the original novel, who on earth would assume that they would pick up the sequel. The people who would pick up the official sequel are people like me, who enjoyed the original Dracula and won't necessarily have watched many of the film adaptations; we're going to notice the alterations and there's a strong possibility that the only reaction you'll provoke is one of irritation. The other main issue that I have with Dracula the Un-Dead is the presence of Bram Stoker himself. The authors state that his inclusion in the narrative was meant to be a tribute to a man who was little appreciated beyond his friendship with eminent actor Henry Irving while he was alive, but the overwhelming impression that I got was not terribly favourable towards the author. While I can concede that depending on how it is written, Bram Stoker could well share the page with some of his own creations. But the way that the narrative unfolds, revealing that Stoker got the inspiration for his novel from some drunken stranger's story at a pub in Whitby and managed to get quite a lot of details wrong in the process, it gives the impression that he didn't actually have any decent ideas of his own. Combined with the way that the narrative quite happily alters or reimagines parts of the original Dracula, it seems less a tribute to a man poorly received in his own lifetime and more like a seriously backhanded compliment at best. Honestly though, I feel bad that these issues were so big for me, because by itself Dracula the Un-Dead is actually a pretty decent vampire novel. There's intrigue, double-crossing, interferences from the police, violent deaths and blood up to your eyeballs. If it weren't trying to be an official sequel to one of the most influential Gothic novels ever, I could have enjoyed this a lot more.